Directory Tractor Trailer Repair Service in St Augustine Jacksonville. Electric Horse Trailer Brakes repaired. Smashed trailers rebuilt & repaired. Sandblasting, paint stripping, rust removal services. Fifth Wheel & Gooseneck Trailer Repairs. 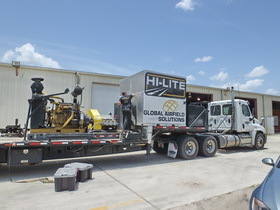 Here is a partial list of the Tractor Trailer repairs done with After Hours Trailer Repair Service, or our Mobile Trailer Repair service for St Augustine Jacksonville. This Tractor Trailer is a Car Hauler that received electrical wiring repairs. Click on the picture or on this link to see many descriptions and pictures of the work performed. This Tractor Trailer Repair in St Augustine Jacksonville has on a huge water leak from an Aluminum tank that was leaking on Airport Runways. Click on the picture or this link for descriptions and many more pictures. Some people call it a Tractor Trailer because of its size. But technically it's a Gooseneck Trailer. 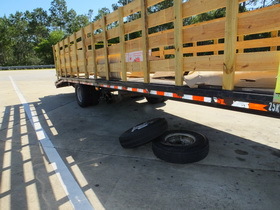 The FL DOT grounded this trailer due to safety reasons. 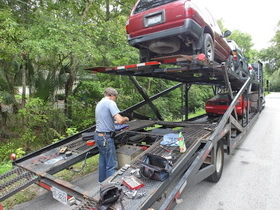 My Mobile Trailer Repair service from St Augustine Jacksonville Fl was called in to fix it up and get it rolling again. Click on the picture or this link for more description and more pictures. It was repaired and rolling again the same day he called me. We rebuild, overhaul, refurbish & repair car carriers, auto transport trailers, semi tractor trailer car haulers. Any brand. To see pictures and explanations click on a page link below. 01 Before pictures of the damage. 02 Rebuilding car hauler frame drivers side. 03 Rebuilding car hauler frame passenger side. 04 Rebuilding car hauler hydraulic stabilizer frame mount flange. This is a mobile cast iron welding job on a diesel engine block. The truck was in a accident and as well as extensive body damage, the cast iron diesel engine was also damaged. If I could not fix it for them, their next alternative was to buy a brand new engine and swap engines out. To see the page that shows the engine block repair process, click on the picture or click on this link. I also install gooseneck tow hitches and fifth wheel tow hitches with wiring and brake controllers. Remember, I work by appointment only, so be sure to call and schedule us. 904-638-8338 Call me, 7 Am to 9 Pm, any day of the week. I have many trailer axle replacement job pics to show, but not enough time to add them to this website yet. Boat Trailer Repairs. Trailer (horse) rebuilding. Smashed trailers rebuilt & repaired. Our company name is "After Hours Welding & Trailer Repair." We serve all of St Johns County and surrounding areas. We do very low-priced, competent & quality work, by appointments only every day of the week. Yes weekends and holidays to. Call anytime thanks to the magic of cell phones, I probably am available to answer you're questions. I'll be happy to give you the information needed in order for you to make a wise, informed purchasing decision.